Love & Sax Live from The Legacy Theatre, Tyrone, Ga. Smooth Jazz Saxophonist. Jason’s smooth and contemporary sound allows him to perform in a variety of venues and diverse settings. He has performed at numerous jazz festivals to include the Atlanta Jazz Festival, Montreaux Jazz Festival and the Riverwalk Festival. He has toured throughout the Nation sharing his gift of music with many powerful ministries within the United States, United Kingdom and the Caribbean Islands. I hired Mr Jason Bitten for a romantic birthday dinner for the special man in my life with some family and friends.He was very professional and on time.He chose the playlist and and did an excellent job.All who attended was very pleased and impressed.Thanks Jason for making our evening soooo special people will be boosting about this for weeks.Jason is highly recommended. We booked Jason for our wedding ceremony. He is an an amazing sax player and did a phenomenal job playing. He was easy to work with and went over and beyond preparing for specifics music I requested. He is extremely talented and professional. I highly recommend using Jason for your next event. Jason played for my Pastor's Appreciation Banquet in Snellville, GA. The music was awesome and perfect for the occasion. There were so many people who said they loved the music and were even talking about it the next day. Jason is a true professional and awesome at his craft. If you have the option to book Jason, you will not be disappointed. I know that I will definitely use him again at other events. Thank you so much for helping to make this event so special for us all. Excellent performer! Arrived on time and kept in contact with me until the day of performance. You will not be disappointed.....Jason was punctual & professional and I will definitely request his services again. He did an amazing job and everyone enjoyed the evening. My guests didn't want him to leave!!! Thank you so much for making my birthday special. Jason performed at my mom's 65th birthday celebration and did an amazing job! He was punctual & professional and I will definitely request his services again. Jason and his group made this day so much more amazing! I am spreading the word about the amazing music! I love the way Jason interacted with the crowd. Fantastic! Jason played for my son's wedding reception at Moore's Mill Club in Auburn, AL. His music was awesome. It definitely made for a perfect wedding for Anna Katherine and Hal. There were so many people who said they had so much fun. We didn't want this beautiful day to end. I hope I have the opportunity to hear you again. Thank you so much for helping to make this day so special for us all. These guys were just great, all the music and song sounded awesome. Would love to here them anytime. From the very first phone call to the moment we met, I knew that Jason Bitten was the right person for the job. It was a pleasure doing business with him. He has a reassuring demeanor, an eye for detail and is very professional and friendly. Jason. was extremely flexible, prompt and went way above and beyond to make my Boss's birthday perfect. He is an exceptional saxophone player, he plays with passion and his sound is very inspirational, rich, full and emotional. I will definitely use his services again and I recommend him highly. Jason played for my wedding ceremony and did a beyond exceptional job. Throughout the process of booking he stayed in contact, was very communicative, and extremely professional. He played along with a keyboard player I hired and together they played as though they'd been playing together for years. His sound was exactly what I was looking for...strong, smooth, contemporary jazz. The music was absolutley captivating, and if ever I am in need of a sax player, I'll be calling Jason hands down. I am forever in debt to Mr.Bitten for making my wedding unforgettable and magical. To encourage, uplift and restore are what Saxophonist, Jason Bitten describes as the inspiration for his music. Jason's smooth and soulful sound touches the untapped emotions of his listeners. 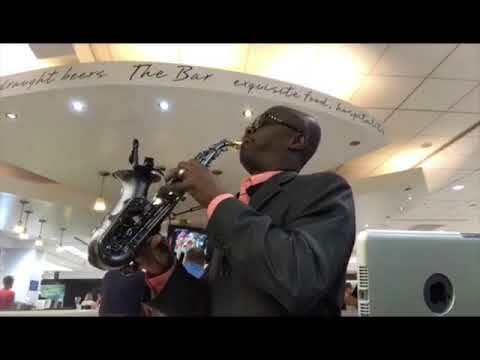 Those seeking inspiration and jazz enthusiasts find Jason's instrumental ballads the "Calm after the Storm"
A native of Birmingham, Alabama Jason began playing the saxophone at the age of 12; oblivious to the journey he was about to embark on. In 2002, Jason independently released his first CD entitled "At Midnight." He quickly became a sought after musician accompanying and opening for national R&B and gospel recording artists and performing at conferences, churches, and jazz festivals internationally and throughout the United States. Jason has had the honor to perform for many dignitaries including Former President Jimmy Carter, the late Mrs. Coretta Scott King and Mr. Vernon Jordan Jr. In 2016, he was an invited musician to perform at the White House for the Obama Administration White House Holiday Tours. Jason continues to perform nationwide and when not touring, he can often be spotted serenading passengers at Atlanta’s Hartsfield- Jackson International Airport. It is the crushing of the olive that brings forth the oil. While traveling extensively and working on his 3rd project, Jason was diagnosed with embouchure dystonia, a rare neurological disorder that affects the muscles within the region of the mouth. Faced with a disorder that could possibly end his career, his only option was to call on the healing power of God. The three-year battle with embouchure dystonia humbled Jason; it deepened his relationship with the Father and taught him the true meaning of trusting God. This test was confirmation of his calling and the birth of his ministry. The gift that God has placed in Jason is far from entertainment but is truly nourishment for the spirit, mind and body. Jason plays under the anointing of the Holy Spirit, his love and passion for God pours out in every note. He receives numerous testimonies of healing both physically and mentally as he evangelizes through music and shares the impartation of God's healing power in his life. A recipient of numerous community humanitarian awards, Jason believes in impacting his community. He visits local schools inspiring students to pursue their dreams. He established the Bitten Dream Foundation, an organization that provides mini scholarships to local students. Jason resides in metro-Atlanta with his wife and three children.